From China to France, the world’s architecture is one of the best things that a traveler should experience while touring the many places in their lifetime. Some of that great architecture includes some of the most beautiful bars that mankind could ever imagine. 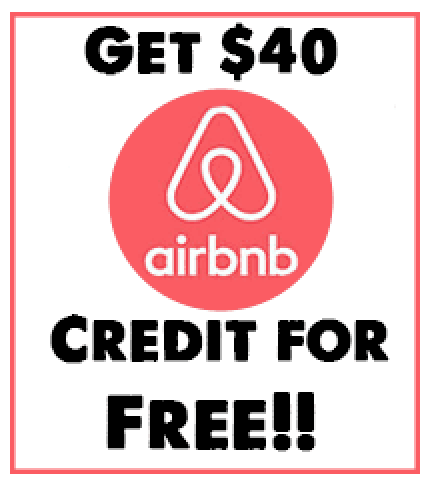 Throughout this article, you will get a chance to explore some of the most amazing places in the world for you to have a drink and enjoy some great music while you are vacationing and exploring the world from the comfort of your own home. Through vivid descriptions and imagery, you will get a chance to imagine yourself in these places that will hopefully one day become a reality for you. Each bar has its pros and cons, which you can determine after you do your further research. Now to begin, we will travel the globe to the wonderland of Thailand that appears twice on this list. 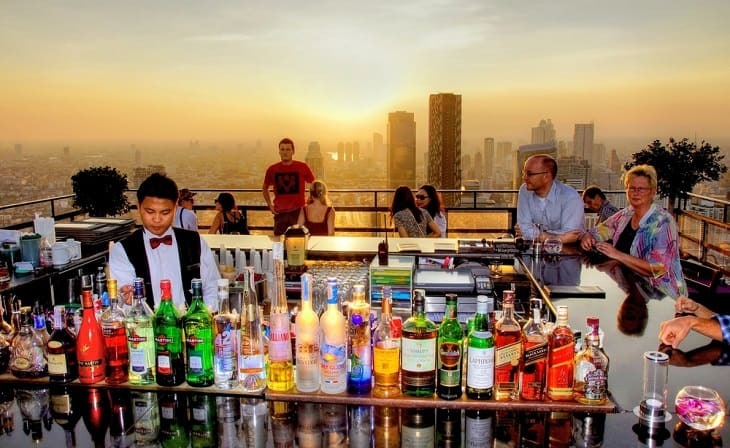 Thailand happens to host some of the most amazing sky bars that you will ever find in the world, however, the Moon Bar, that is located in Bangkok, defines true architectural beauty that will make your mouth drop. The Moon Bar features a gravity-defying restaurant and bar that sits at the top of a 61 story building that is so close to the sky that you might find yourself reaching for the heavens. The bar features a 360-degree view that extends in all directions, allowing you to take in the splendor of Bangkok’s cityscape. The drink menu features classic cocktails that are known in some parts of the world as well as some signature drinks. 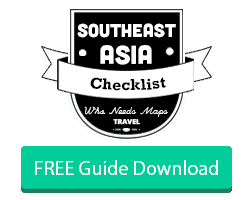 FREE Download: Get the Perfect SouthEast Asia Travel Checklist, Send it to me! 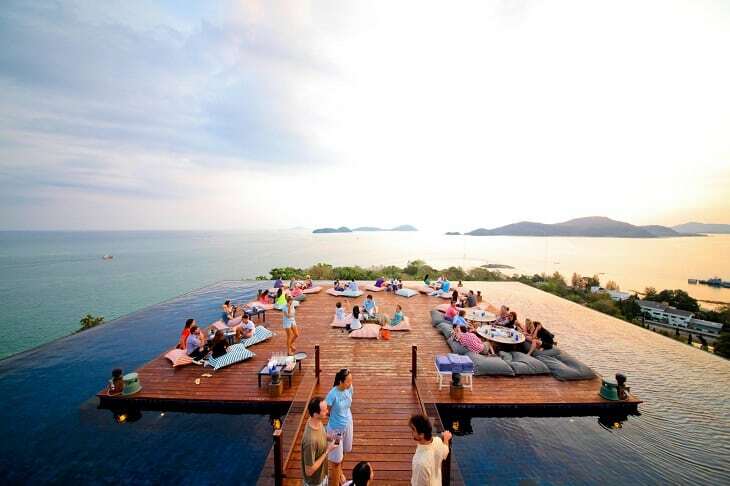 Bangkok isn’t the only place in Thailand that features a beautiful bar. Traveling to Phuket, Thailand, you will find that it is home to the stunning Baba Nest at Sri Panwa. This beautiful floating bar is located right in the center of a mountaintop infinity pool, which is located at the Sri Panwa resort. The bar is decorated with comfortable, oversized pillows that you can relax while being served Sri-jitos. Sri-jitos happens to be Sri Panwa’s version of a mojito that is mixed with lemongrass-infused Grey Goose Vodka, lemongrass tea, that is accented with mint and fresh lime. 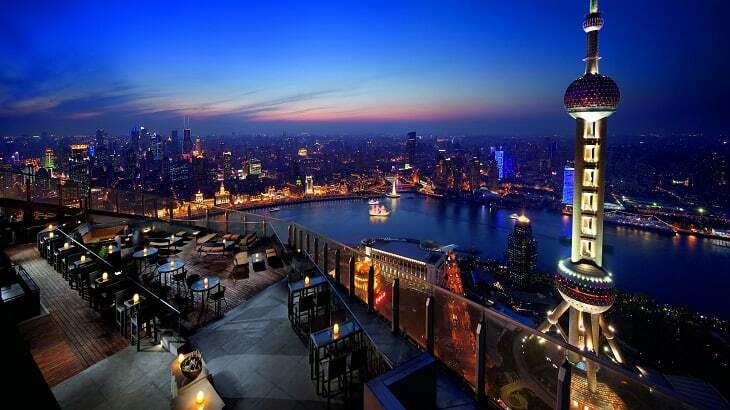 If you truly want to experience the best views and drinks while visiting Shanghai, then the Flair Rooftop Restaurant Bar located on the 58th floor of the Ritz-Carlton, is the best place for you. 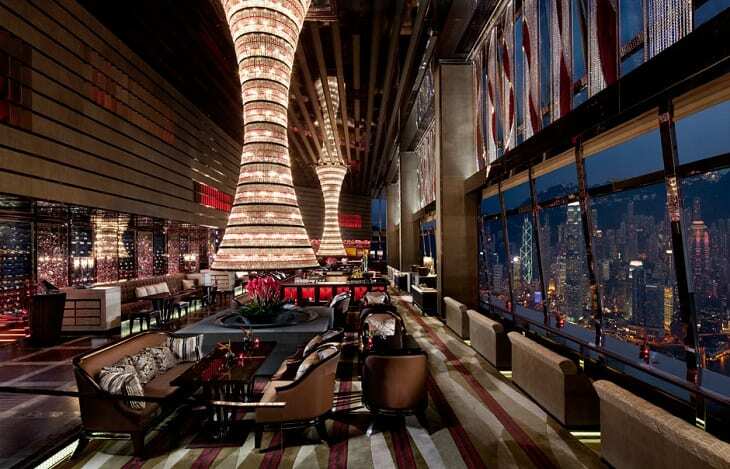 The bar overlooks the Huangpu River as well as the budding skyline. The cocktails are made to perfection to satisfy the late night drinker in you, however, if you are not into drinking, that’s okay; you can also enjoy a delightful cup of tea from 2 p.m. to 4 p.m. on weekends. Cabo San Lucas, Mexico was late to the party in regards to creating a rooftop scene, however, once it did catch on, it was done right. 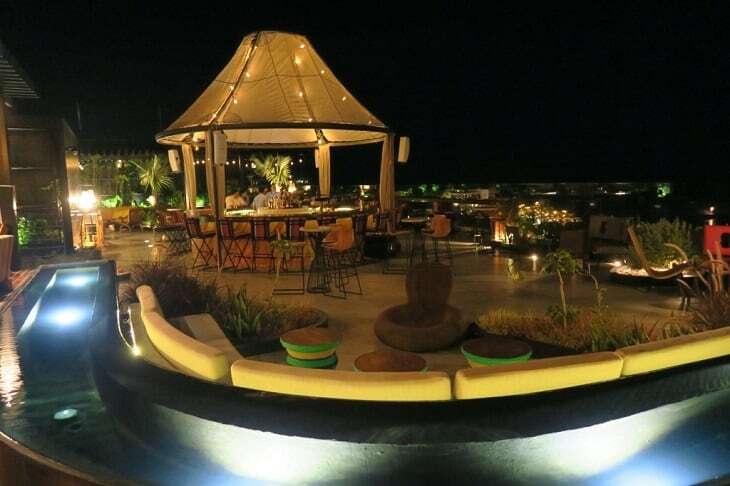 Currently, this high-rise bar happens to be the first and only one located in the city. The Rooftop opened in the fall of 2015 and is still one of the must-see places during a vacation. 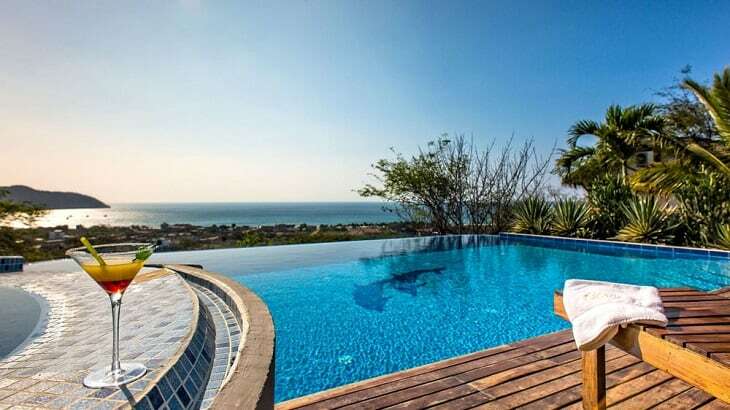 From the rooftop, you will be able to enjoy the view of the Sea of Cortez or the El Arco natural rock while you sit back and sip on one of the many cocktails on their menu by the recognized mixologist Osvaldo Vazquez. 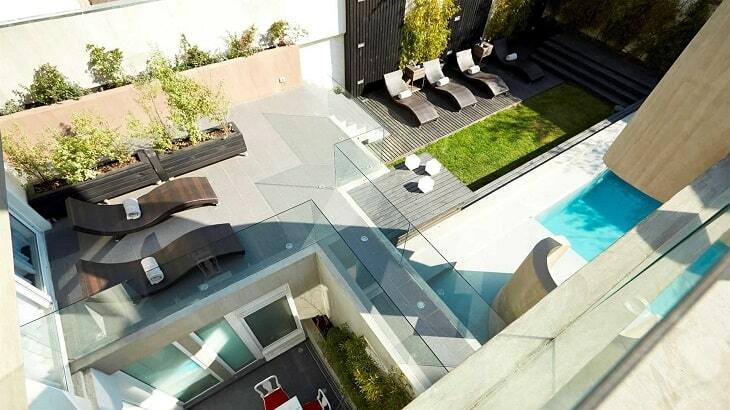 This might be one of the best-kept secrets, until now. This small bar sits atop of the Casa Gangotena mansion, which was restored back in 2011. The bar has a view that oversees the Plaza San Francisco, which is located in the middle of the Quito’s colonial Old Town. A little history about this Old Town is that it happens to be the world’s first UNESCO World Heritage Site. The City of Lights is one of the places in the world that defines romance and beauty and L’Oiseau Blanc at the Peninsula happens to be one of the city’s crowning glory. 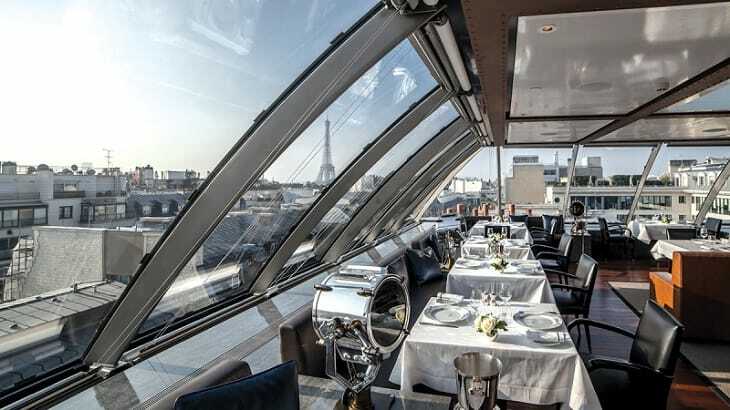 This rooftop bar has an aviation-themed lounge that provides a beautiful view of the Eiffel Tower. The decorations include an actual plane inside with cocktails like “Aviation” and “Take Off”, paying respects to pilots Charles Nungesser and François Coli. These pilots happen to be the first French pilots to navigate the plane L’Oiseau Blanc over the transatlantic between Paris and New York on the plane. Located in Hong Kong, this bar fulfilled the bucket list of all bars by being the world’s highest rooftop bar. Located on the 118th floor of the Ritz-Carlton, you will be able to take in the beautiful views of Hong Kong Island and the best part is you get to enjoy a drink or two. Traveling to South America’s western coast to Chile, you will find this bar located at on the rooftop of the Tinto Boutique Hotel. This bar happened to fly under-the-radar for a while, but no more. While having a drink, you may find yourself holding conversations with the jet setters and artists of Chile. This a members only bar, however, don’t fret, as a non-member, you will be able to access it for nightcaps, all you have to do is first dine at the Restaurant 040, which is located on the hotel’s lower floor. These are just 8 of the world’s most breathtaking rooftop bars that are located in the world. There is plenty more of course. 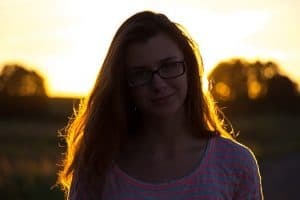 Each of these bars does have their pros and cons, but the wonderful experience that you can have will definitely outweigh the cons, making it all worth it. We hope you enjoyed this article as much as we enjoyed writing it. Hopefully, you’re already in the midst of planning your visit to one of these bars after reading this article. For more, follow Lily on Twitter or on her blog, SkyWeFly. 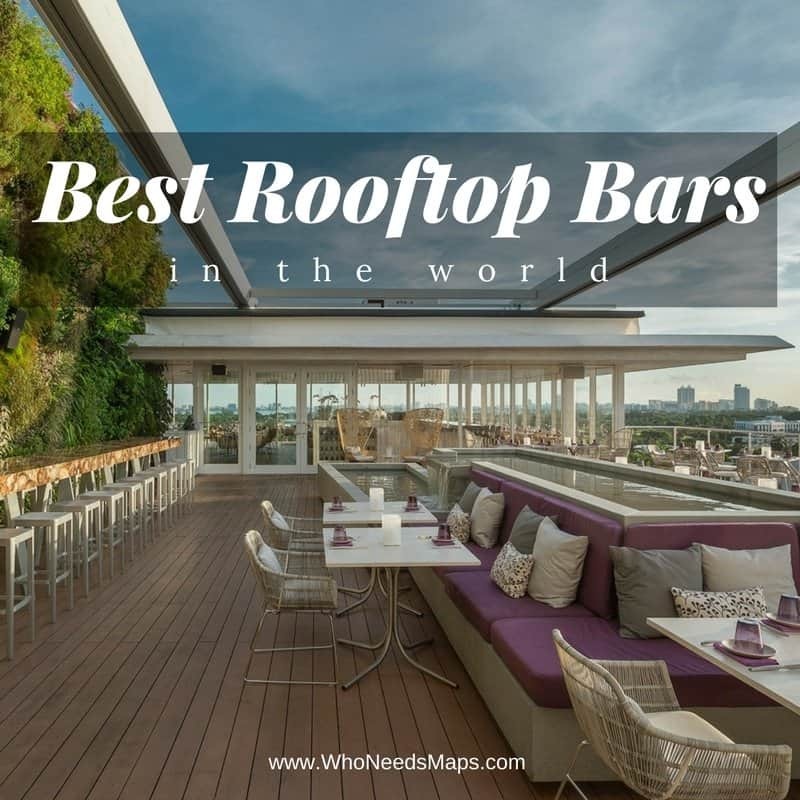 Tell us about your favorite rooftop bar!